A Cardboard Problem: Why does Topps want to break my heart? In 2008, when Topps first came out, I rushed to Target to buy a few packs of the base cards. I didn't mind spending $9 for three packs. I get the sweet, sweet feeling of ripping open packs and perhaps, getting my first 08 Derek Jeter card to boot. I rip the packs. No Jeter. I get a rack pack. No Jeter. I look on eBay. No Jeter. So, I look at the checklist. Holy crap. No Jeter. 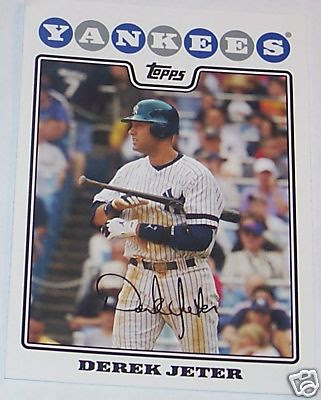 Jeter wasn't released in Series 1 of the product. He didn't show up until card #455. As you may have read, Marie and I have bought a case of 2009 Topps as part of our business venture. Considering the amount of doubles you get in a case, I always take a Jeter base and she will get a Pujols base. So we all win in the end. Then I looked at the checklist for 2009 Topps Series #1. Everyone wins, but me. I'll let you have a Pujols. But since we are only going to get one, if any, you'll have to share mine. Jeter not in series 1?? two years in a row. that is ridiculous. And then when he finally gets a card it's kinda weak for a superstar. Is the chrome version any better. A lof the CHrome cards from 08 Topps had different pictures that seemed much better than topps base. It was a different picture, but not very good. He looks like he is heading back to the dugout after grounding out at Fenway Park.